Each December the Year 7 Christmas Fayre marks the start of discussions and excitement of the annual pilgrimage to the Forest of Dean for Year 7s. Any profits made from the students’ hard work and effort of the Year 7 Christmas Fayre subside the costs of the St Briavels residential which every Year 7 has the chance to attend in the following June. 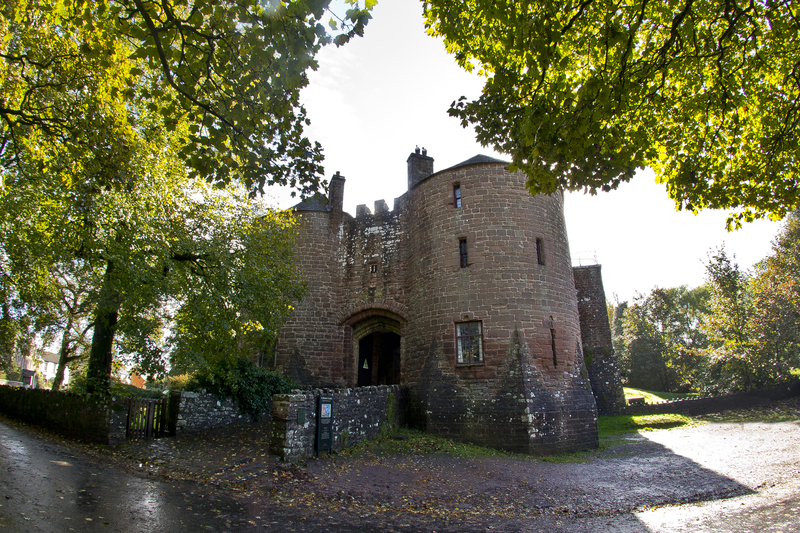 Henry Box students have been going to the Forest of Dean and staying at St Briavels castle for nearly 40 years! It is a much treasured residential. Being away from home, trying new things, gaining confidence, making new friends, being more self-reliant, being encouraged to grow, being independent. "Ethan enjoyed his trip to St Briavels. It gave him confidence in himself." "Great trip! Children could feel a bit of independence. Wonderful adventure, I am happy that my son could go there." 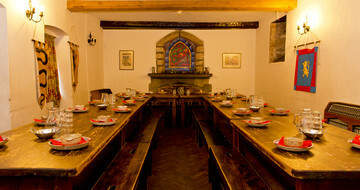 "Shannon had a wonderful time at St Briavels, thoroughly enjoyed herself. All the activities that she took part in, she said she had fun with her friends, teachers and staff." "Now, almost 5 days later, and we are still coming out with something that happended whilst staying in the castle." Tintern Walk or Wye Pursuits activities in Tutor groups. Pre-breakfast and activities: Pack and clear rooms. Luggage to be moved to holding area ready for departure. Lunch Packed lunch required from home. Packed lunch provided by YHA. Packed lunch provided by YHA. St Briavels Castle – YHA. On return – luggage gets packed on coach ready to leave. Evening Dinner, duties and evening activities. Dinner, duties and evening activities. 7:00pm departure, expected arrival at HBS 8:30pm. An early start on Day 1 with two visits on route to the castle home for the following two nights. First stop, Chepstow Castle where students will get to explore and complete a quiz, before setting off to their next stop they will have lunch. The second stop is Clearwell Caves, where everyone will enjoy an interesting and informative tour. Finally, on to the YHA. St Briavels Castle is over 800 years old (that’s older than some of the teachers!). Day 2 and day 3 are a mirror of each other and students will either be taking part in a hike to Tintern Abbey or be enjoying two of the following activities with Wye Pursuits (canoeing, climbing or caving). Wye Pursuits have well qualified and very experienced activity leaders; we’ve been using them for about 15 years and year after year we have many of the same people running the activities. Students have a chance to put their preferences forward for the two activities they would prefer to participate in. Majority of students will get their chosen preferences, but due to number constraints for each activity this cannot be guaranteed. No student will be forced to do an activity they fear. Every evening the students all come together for some great evening fun arranged by staff, from Talent shows to outdoor games. 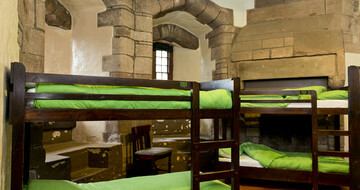 Accommodation at the caste is dormitories, all bed linen is supplied. Except for the first packed lunch on Day 1, all meals are supplied by the YHA. Each morning is a hearty breakfast to set students up for the day, lunches are packed lunches as the students are on the go for days 2 and 3 and each evening students will pre-order in the morning their evening meal. A vegetarian option is offered for every meal. Please inform the school of any dietary requirements that your child may have and these will be accommodated whilst away. Hygiene is very important over these three days, as the students are very active. Students will be encouraged to shower daily, change their clothes and clean their teeth, just as they would at home. Please no spray deodorants as they can be known to set of fire alarms. We suggest bringing old clothes as we have had years with lots of rain and mud and other years of heat and lots of sweating! Clothes should be comfortable and suitable for outdoor activities, please see the kit list. Designer clothes are best left at home, as they may never be the same after this residential! Students are asked not to bring anything of any value; they will be responsible for their own belongings. No mobile phones please, we want to encourage friendships and engagement in the planned events. Also, staff who have worked at other schools report no end of problems in dormitories with people awake through the night on their phones. Students will need a good night’s sleep to get the most out of the daily activities. If students are discovered with mobile phones they will be confiscated and returned at school. Please support us with this. Some students may worry about homesickness, this is totally normal, although we have found that most students are too busy with activities to worry. Please be assured that hearing nothing from them is a good thing, if there are problems our leaders will contact you. Daily Facebook updates from the staff will come through; these are usually in the evening after all are settled. Reception is not the most reliable in the area and sometimes staff struggle to upload lots of pictures. Staff with each group carry a school mobile phone in case of emergencies, if you need to contact your child urgently please contact the school and a message will be sent to staff to contact you back. School policy is to monitor student’s behaviour on trips: if it’s unacceptable students may not be allowed on future trips. Should your child’s behaviour be unsatisfactory or unsafe parents will be contacted, if necessary parents may be asked to come and collect their child. This has happened very rarely but I have to say it, just in case! ).